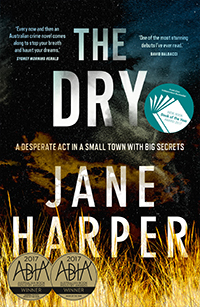 In The Dry, Jane Harper manages to make of both the relentlessly hot drought and the oppressive rural Australian town two palpable characters that potently influence the thoughts and behaviours of the other, human, characters. The weather and the town are both portrayed as malevolent organisms. The central character, Aaron Falk, spent his formative years in the town, but left for the big city because of possibly unfounded accusations against him and his father. He has returned because his friend of twenty years ago is dead from a murder-suicide. Or is it murder? Falk is a federal police officer, but his investigation of events is both personal and ‘off-duty’. With few exceptions, no-one in the town welcomes his return or his ‘interference’. He is still under the cloud which hung over him twenty years ago and people will not let him forget. The town will not let him forget it either and concerted, escalating attempts are made to have him leave. The cloud – existing despite the ever-cloudless sky – concerns the death of another teen friend those twenty years ago. As in any thriller deserving the epithet, in The Dry the clues mount up and the reader is, along with Falk, left wondering what is true, what is false and which of all these are red herrings. There are characters who are nasty, even despicable and, therefore, easy suspects. There are others who, perhaps, should be. However, the truly, overriding villain is the town. Jane Harper is brilliant in keeping this aspect of the whodunit simmering, to chilling effect. Falk’s probing opens old wounds for himself and others, yet he perseveres. He has few supporters in the town and is frequently on the verge of driving away. There are aspects of the novel that reminded me of The Dressmaker, especially the part played by the town and its attitude to the ‘horrible’ child who has returned as an adult, and the spectre of a cleansing and retributive fire. This book grabbed me – I had to read it in large chunks, and the last hundred pages in one final indulgence.